These dramatic earrings by Sparkling Sage are not for the faint of heart! They feature 18kt. 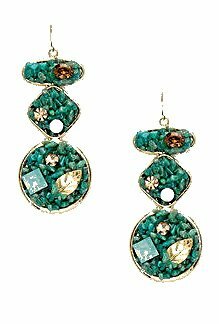 gold plated triple drops with gold plated leaves and Swarovski crystals in Pacific Opal, White Opal, Light Colorado Topaz and Smoky Quartz set into a layer of genuine amazonite tumbled chips. They have 18kt. gold plated fishhook closures and were made in the USA. Please note that earrings are non returnable. Guaranteed authentic, 1 available.